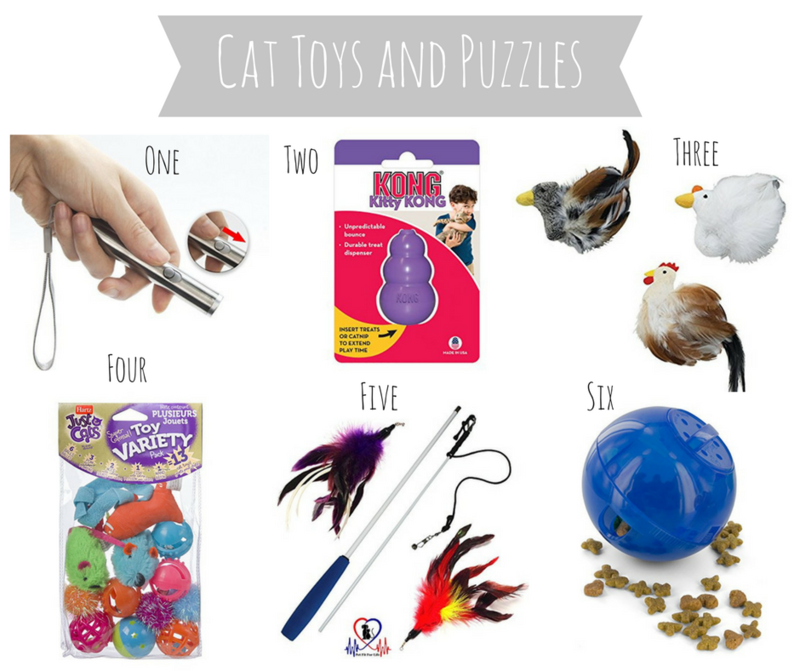 I had so much fun putting this list of our favorite cat toys and puzzles together! We’ve been owned (yup, you read that correctly) by our cat, Malcolm, since September 2016. He has definitely made it known what he likes and dislikes, as I’m sure many cat owners can understand. Here are six toys and puzzles we use and love for our fur baby, Malcolm! Ah, the good old laser pointer! This is something cats tend to love because of their prey drive. This is also a great way to get them exercising. It amazes me how high Malcolm will jump up a wall to try and get the laser! Cats can go one way or the other with catnip–apparently a cat’s love of catnip is an inherited gene. If they don’t have the gene, they won’t go crazy over catnip like some cats do. Malcolm doesn’t really cat about catnip, but he is obsessed with this toy. Obsessed. The first time we brought it home, he went crazy and had a blast ripping all the feathers out until just the head remained. You can watch him (and Lola!) in action in this vlog. We then called the toy Mr. Chicken Head. I’m convinced there’s something magical about this toy because our dogs are obsessed with it, too. All of our animals fight over this toy, and it’s literally just a head now!! The only warning I have about this toy is that it is messy if your cat pulls the feathers out. If you aren’t sure what kind of toys your cat likes, I’d recommend getting a variety pack that has toys in different shapes and sizes. Some cats like toys that make noise, and Malcolm especially loves mice that make a rattling noise. Our dogs love the mice, too. In fact, Lola and Mavis were (playfully) fighting over one of Malcolm’s toy mice last night while Malcolm sat above them on a side table and watched, haha. Feather teasers are another toy that really play off a cat’s prey drive. I like feather teasers because they really get you and your cat playing together. We have gotten Malcolm to jump so high while playing with a feather teaser and he just loves “hunting” that feathery string! If your cat is a fast eater or likes to play with their food, I’d suggest trying out this puzzle feeder. You can put dry food or treats inside and your cat has to roll the ball around to dispense their food or treats. It’s a wonderful way to get them exercising, too! It’s funny how picky cats can be sometimes. We’ve bought Malcolm fancy toys and he has been so-so about them, and then we find him playing with things like Q-tips, rubber bands, water bottle caps, ear plugs, rolls of washi tape, and more. You just never know! A few other things we’ve found that Malcolm loves are ping pong balls, Lola’s toy hedgehog (which is hilarious because it’s basically half of the size of Malcolm and he carries it around! ), and a crinkle tunnel that he uses to hunt Mavis LOL. That Malcom is one if a kind! Yes he is! Love you! Rue and Malcolm are so similar. She bats Ava’s toys around and the lids off of applesauce and yogurt pouches and…anything lying around. She’s addicted to strings and has nearly taken an eye off Kevin and myself when we’ve been wearing hoodies with drawstrings. She likes to play with her toys but we have them mostly tucked away now. At first we didn’t want Ava playing with them and now Ava is really good about knowing the difference between her toys and Rue’s toys. We’ll probably have to tuck them away again when Owen starts moving around but I should get them out for Rue in the meantime. I love how similar Rue and Malcolm are! It’s so funny how some cats just love “human stuff” like strings, lids, etc.! Also, how sweet that Ava knows the difference between her and Rue’s toys! I love that! Ping pong balls are a great idea!! I bet Zelda would love that. She loves allll the small things–honestly, anything small that she can knock to the floor and toss around. She adores hair ties and little wrist bands, and especially mice. Her favorite mice are the ones that make noise, but she’ll take any. She was quite perturbed when Kona chewed up one of her mice, lol. I’ve always wanted to try a feather teaser with her, but Zelda is so rough on her toys, she’d tear it right up, haha! Oh and of course she loves cardboard boxes and her crackle tunnel. ❤ Cats are such a blast! They have the quirkiest personalities. I think Zelda would have so much fun with ping pong balls! The only downside is that they get lost underneath things so easily. Thankfully, a big pack is super cheap, so it’s no biggie to lose some here and there, haha. I always find like 5 or 6 when I clean! LOL at Kona chewing Zelda’s mouse and her being upset! Too funny!! Also, maybe there are some heavy duty feather teasers out there for Zelda?! Yay! I hope it’s useful for you sister’s cat!! I never thought about using the laser pointer outside at night. I NEED to do that with Mavis ASAP! I think she will go crazy for that!